Take me out to the ballgame? Yes, please! Fandom is even better when you feel part of the team, and with this custom Los Angeles Angels MLB Personalized Nameplate, you'll feel right at home with the iconic Anaheim team. 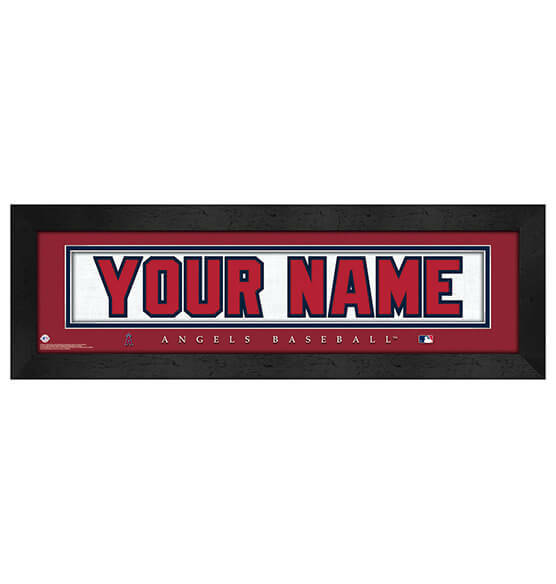 Our made-to-order nameplate is customizable up to 12 characters and makes a fantastic gift either for yourself or a die-hard Los Angeles Angels fan. High-quality glass, sleek black frame and eye-catching team colors look great in the home or office. Designed to look like the back of a Los Angeles Angels jersey and ready to hang with a conveniently included sawtooth hanger, you can hoist your halo as part of this legendary franchise.